Starting Monday, 2 February 2015 (because the restaurant is closed on Sunday), customers can wake up to free coffee at Chick-fil-A. 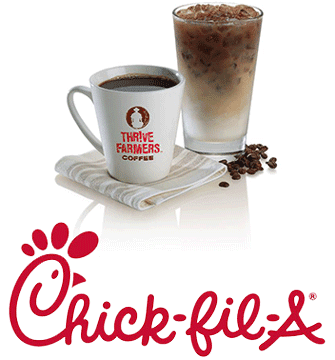 For the entire month of February, Chick-fil-A restaurants nationwide will give customers free cups of its new specialty-grade THRIVE Farmers™ hot or iced coffee all day long. THRIVE Farmers' blend is unique to Chick-fil-A, as it has been roasted with characteristics and flavors that complement the chain's breakfast menu. Both Chick-fil-A's hot and iced coffee are prepared fresh throughout the day. The iced coffee is prepared with an exclusive blend of THRIVE Farmers' cold-brewed, specialty coffee beans and fresh two percent milk, sweetened with pure cane syrup and served over ice.